Calvin Baxter Gage was born on 20 March 1856 at Texas. He was the son of William Gage and Elizabeth A. Townsend. Calvin Baxter Gage married Sarah E. Pointer, daughter of John Thomas Pointer and Kesiah Schenck, on 19 December 1883 at Erath, Texas. Calvin Baxter Gage died on 29 April 1938 at Texas at age 82. Name Variation Adelia F. Pointer was also known as Adela. Married Name 23 June 1881 As of 23 June 1881,her married name was Osborn. Adelia F. Pointer was born on 5 September 1861 at Indiana. She was the daughter of Standley Pointer and Caroline Pointer. Adelia F. Pointer married Sylvester G. Osborn on 23 June 1881 at Erath, Texas. Adelia F. Pointer died on 13 February 1922 at Idaho at age 60. Married Name 28 February 1882 As of 28 February 1882,her married name was Higgins. Rosa Lee Pointer was born on 25 June 1865 at Indiana. Rosa Lee Pointer married Simon P. Higgins on 28 February 1882 at Erath, Texas. Rosa Lee Pointer died on 16 March 1940 at Smith, Texas, at age 74. Name Variation Iva Fenton Pointer was also known as Ivy. Name Variation Iva Fenton Pointer was also known as Iva Lee. Married Name 30 October 1887 As of 30 October 1887,her married name was Kessler. Iva Fenton Pointer was born on 15 June 1870 at Indiana. Iva Fenton Pointer married Benjamin Franklin Kessler, son of Solomon Kessler and unknown (? ), on 30 October 1887 at Bates, Missouri. Iva Fenton Pointer died on 30 April 1925 at Oklahoma at age 54. Simon P. Higgins was born in May 1858 at Missouri. He married Rosa Lee Pointer, daughter of Standley Pointer and Caroline Pointer, on 28 February 1882 at Erath, Texas. Sylvester G. Osborn was born in February 1859 at Missouri. He married Adelia F. Pointer, daughter of Standley Pointer and Caroline Pointer, on 23 June 1881 at Erath, Texas. Married Name circa 1903 As of circa 1903,her married name was Kessler. Minnie E. Payne was born circa 1884 at Indiana. She married John N. Kessler, son of Solomon Kessler and Martha Hannah Pointer, circa 1903. John Foster Kessler was born on 11 March 1915 at Montgomery, Indiana. He was the son of John N. Kessler and Minnie E. Payne. John Foster Kessler died on 19 March 1991 at age 76. Name Variation Elanora Pointer was also known as Nora. Name Variation Elanora Pointer was also known as Ellnora. Married Name 3 September 1882 As of 3 September 1882,her married name was Gage. Elanora Pointer was born on 14 May 1867 at Indiana. She was the daughter of John Thomas Pointer and Kesiah Schenck. Elanora Pointer married James Gage, son of William Gage and Elizabeth A. Townsend, on 3 September 1882 at Erath, Texas. Elanora Pointer died on 1 May 1938 at age 70. Mary V. Pointer was born circa 1877 at Missouri. Mary V. Pointer died before 1928. James Gage was born on 2 February 1860 at Texas. James Gage married Elanora Pointer, daughter of John Thomas Pointer and Kesiah Schenck, on 3 September 1882 at Erath, Texas. James Gage died on 29 May 1941 at age 81. Lonnie Lee Gage was born on 23 October 1883 at Hamilton, Texas. He was the son of James Gage and Elanora Pointer. Lonnie Lee Gage died on 14 August 1957 at age 73. William Gage was born on 11 September 1827 at Tipton, Tennessee. He married Elizabeth A. Townsend in 1855 at Texas. William Gage died on 21 March 1898 at Texas at age 70. Name Variation Elizabeth A. Townsend was also known as Bettie. Married Name 1855 As of 1855,her married name was Gage. Elizabeth A. Townsend was born on 2 February 1836 at Mississippi. She married William Gage in 1855 at Texas. Elizabeth A. Townsend died on 24 May 1904 at age 68. Name Variation Mary Abigail Gage was also known as Mollie. Mary Abigail Gage married John Arnold Davis. Mary Abigail Gage was born on 3 May 1858 at Texas. She was the daughter of William Gage and Elizabeth A. Townsend. Mary Abigail Gage died on 10 March 1928 at age 69. John Arnold Davis married Mary Abigail Gage, daughter of William Gage and Elizabeth A. Townsend. John Arnold Davis was born on 2 May 1848 at South Carolina. He died on 13 August 1946 at Texas at age 98. Lee Roy Tipton was born on 19 June 1881 at Coryell, Texas. He married Nannie Blanche Pointer, daughter of John Thomas Pointer and Kesiah Schenck, on 15 October 1932 at Coryell, Texas. Lee Roy Tipton died on 30 January 1946 at Coryell, Texas, at age 64. 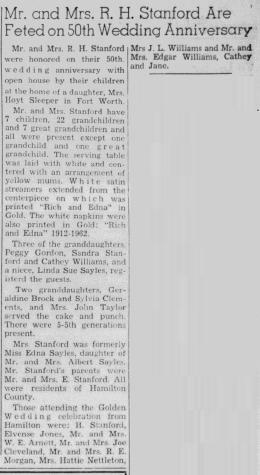 Married Name 6 October 1912 As of 6 October 1912,her married name was Stanford. Edna Pearl Sayles was born on 17 August 1894 at Missouri. She was the daughter of Albert Sydney Sayles and Sue Elzan Pointer. Edna Pearl Sayles married Richard H. Stanford on 6 October 1912. Edna Pearl Sayles died on 30 October 1967 at Hico, Texas, at age 73 Edna Pearl (Sayles) Stanford obituary. In October 1962 at Texas Richard H and Edna Pearl (Sayles) Stanford 50th wedding anniversary. Richard H. Stanford married Edna Pearl Sayles, daughter of Albert Sydney Sayles and Sue Elzan Pointer, on 6 October 1912. Richard H. Stanford died after 1967. Name Variation Merrel E. Sayles was also known as M. E.
Merrel E. Sayles was the son of Albert Sydney Sayles and Sue Elzan Pointer. Merrel E. Sayles died after 1969. Married Name Her married name was (?) Taylor. (?) Sayles was the daughter of Albert Sydney Sayles and Sue Elzan Pointer. (?) Sayles married John Taylor. (?) Sayles died after 1969. John Taylor married (?) Sayles, daughter of Albert Sydney Sayles and Sue Elzan Pointer. Name Variation Mabel Missouri Fletchers was also known as Mable M.
Mabel Missouri Fletchers married Elbert Leroy Foster, son of Ava Jay Foster and Eulala Dell Bond. Mabel Missouri Fletchers was born on 2 December 1911 at Morgan, Missouri. She died on 19 March 2000 at Cooper, Missouri, at age 88. Name Variation Ava Jack Foster was also known as Jack. Ava Jack Foster was born on 5 July 1936 at Cooper, Missouri. He was the son of Elbert Leroy Foster and Mabel Missouri Fletchers. Ava Jack Foster died on 3 June 2004 at age 67. Name Variation Dorothy Jean Schenewerk was also known as Schenwerk. Married Name 20 May 1950 As of 20 May 1950,her married name was Foster. Dorothy Jean Schenewerk was born on 11 November 1932 at Moniteau, Missouri. She married James Reed Foster, son of Ava Jay Foster and Eulala Dell Bond, on 20 May 1950 at California, Moniteau, Missouri. Dorothy Jean Schenewerk died on 12 December 2010 at Greene, Missouri, at age 78. Mary Frances (?) married William David Foster, son of Ava Jay Foster and Eulala Dell Bond. Mary Frances (?) was born on 15 August 1922. She died on 15 February 2000 at age 77. Gladys Frances Bishop married Marvin Estil Foster, son of Ava Jay Foster and Eulala Dell Bond. Gladys Frances Bishop was born on 2 June 1911. She died on 4 May 2008 at age 96. Anne Goldstein married Fred Bond Foster, son of Ava Jay Foster and Eulala Dell Bond. Anne Goldstein was born on 30 April 1923. She died on 5 September 2005 at age 82. Lester Wegner was born before 1909. 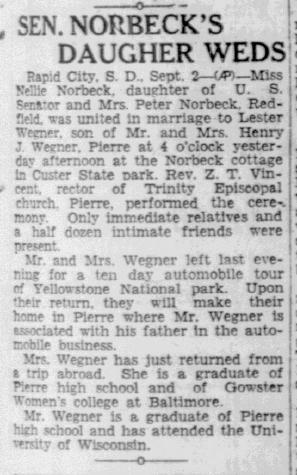 He was the son of Henry J. Wegner. 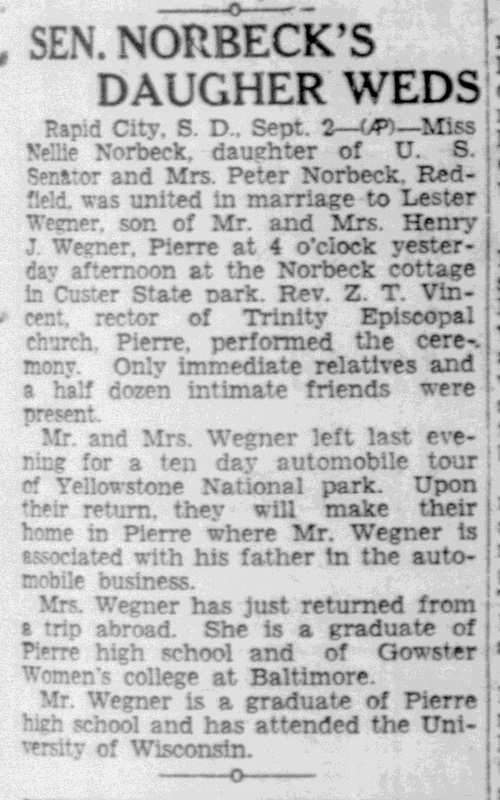 Lester Wegner married Nellie Norbeck, daughter of Governor Peter R. Norbeck and Lydia Theresa Anderson, on 1 September 1927 at Custer State Park, South Dakota, Nellie Norbeck and Lester Wegner wedding announcement.